I work a full time job that often takes me away from the opportunity to sit in my craft room and, well, be creative. I have tried in the last week, in between long shifts and short, sleepless nights, to steal away and play with ink and paper. Today, however, I had a special purpose in my card making. A co-worker had to leave work suddenly last Thursday to go to her fathers deathbed. Having lost my own mother just 2 years ago, my heart went out to her and what she will be feeling and thinking for the next few weeks and months. It's never a wrong thing to make a card. Cards don't fix problems, but they are an expression of love and concern. Today I wanted to create a card that I hope will send that message without saying too much. I decided to use 3 different stamp sets, that I think work together very well. Gorgeous Grunge, An Open Heart, and Awesomely Artistic. 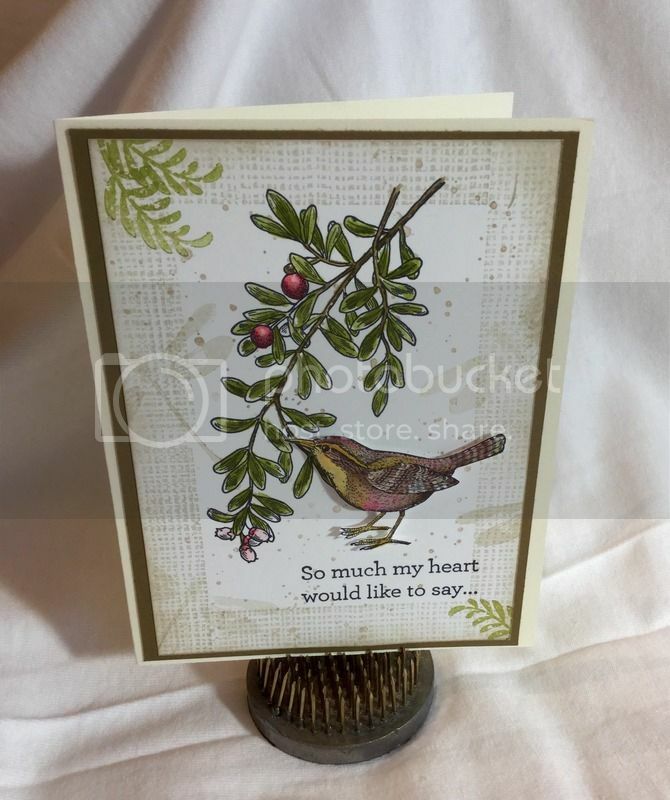 I cut the bird out and popped it on the front to give the card dimension. I really love the soft and subtle colors.